The Common Holly (Ilex aquifolium) is a popular hedging choice for a variety of reasons. As a native, British hedging evergreen species, its attractions are that it is relatively slow-growing, an average of 30cm (1ft) of height growth each year, so litle maintenance required. 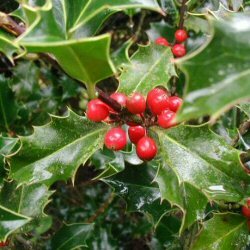 Quite commonly, Holly forms part of a mixed native hedge, especially when planted with non-evergreen species, such as Hawthorn, Dog Rose, Hazel, Elder, Blackthorn and Crab Apple, Holly forming the evergreen component. Holly planted as a pure hedge is simply quite fantastic. As a wildlife habitat, the orange-red berries are very attractive to birds. Holly should be trimmed in autumn and also mid summer if required. Holly prefers either full or partial shade and a moist, but not wet-type soil and copes with exposed sites and seaside locations. Our Holly hedging trees are sold as plug plants, in other words the roots are encased in compost. This means that planting can be carried out at any time of the year, provided they are watered in periods of drought, compared to bare-root plants which can only be planted during the plants normal dormant period (November to March). All of these trees are UK grown, which is important for successful establishment. How many Holly hedging trees do I need? See What Our Customers Are Saying About Our Common Holly Hedging Plants. Holly is not a particularly light demanding hedge tree species and so using it to fill gaps in hedges will be ok. Should you have any doubts about local conditions, plant in a pot and allow the tree to establish and grow more before planting in the hedge.